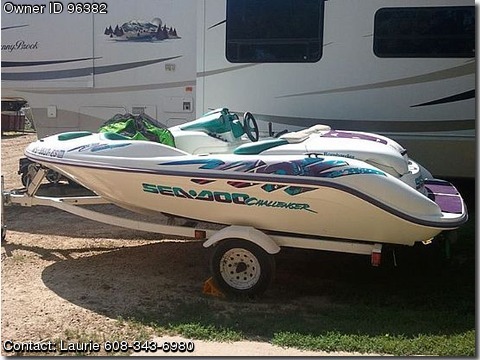 Please see complete details of this boat on THE SEA DOO BOATS FOR SALE BY OWNER WEBSITE www.BOATSFSBO.com/96382 .Please contact boat owner Laurie at 608-343-6980. Jet boat with swim platform. Trailer, skis, ropes, bilge pump, storage, exhust fan, expandable oars, new life vests and nice new pulling tube included, prof. maintained. We are farmers and just do not have time for it. Bought it on a whim this summer and never really used it.